I dared to try something new. I've never gotten on well with origami, but I decided to give it another go and make a winter snowscape - as always, I was aiming very high. But I kind of can't believe how well it came out considering the most advanced thing I've ever made by folding paper was a heart. So to make trees and foxes, well, that was something else! Yes, I jazzed up the picture - so sue me. A little lense flare on the 'star' - which was just a silver accent from a bouquet of flowers I bought my mum two days before - and some overlayed snowfall. There's a picture at the bottom of the post without the snow, but I did accidentally flatten the flare onto the image without realising until it was too late and GIMP decided I wanted it to be permanent and removed the 'undo' option for no good reason, as it often does. I used video tutorials for the origami - it's always easier to do things like this when you have a demonstration you can wind back several times. 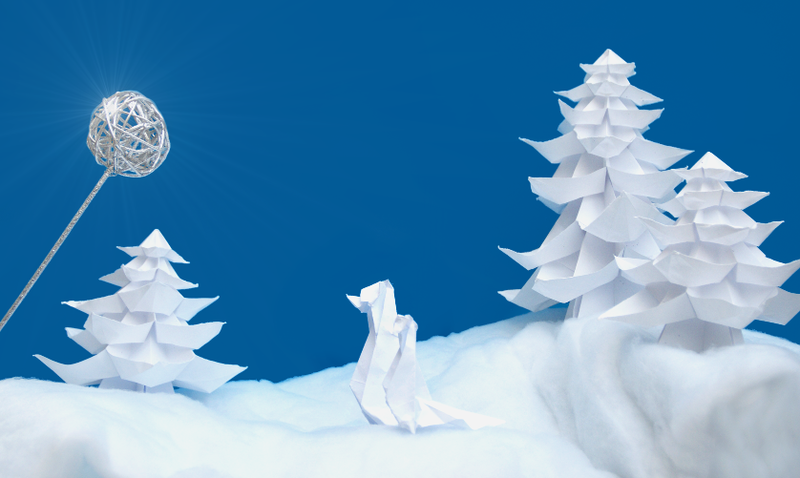 I made the origami arctic fox using the following video and just used different sized paper for the adult and youngster. The fox was really difficult to do so I advise practising on a large A4 squared sheet. The trouble comes, really, with the head. Once you've got that down, you're golden. It was so, so frustrating the first few times and I nearly gave up, but I came back to it a few days later with more patience and it went much better. And I made the Christmas tree with this video, and it was so very much easier than the fox that it was almost therapeutic. I don't claim ownership to either video, nor the websites or people they're affiliated with. I chose these two tutorials because I liked the shape of the finished pieces.